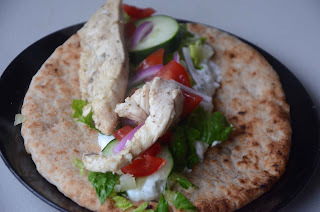 This chicken gyro recipe is everything we've been looking for in our food lately--wholesome, not time consuming to make, and still great tasting! 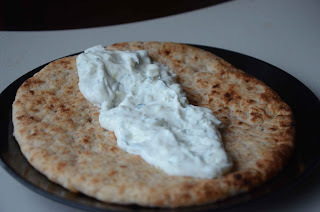 My kids went a little light on the tzatziki sauce, but I liked mine oozing with it. 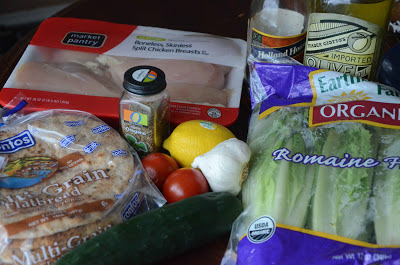 You can grill the chicken if you prefer, but ours is out of order so we went with the stovetop instead. These also make for a great lunch. Just pack the toppings and flatbread in their own little containers and throw together at lunch time. No need to even heat them! Enjoy! 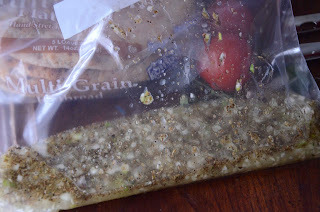 Combine garlic, lemon juice, vinegar, olive oil, oregano, salt and pepper and pour into a large Ziploc baggie. 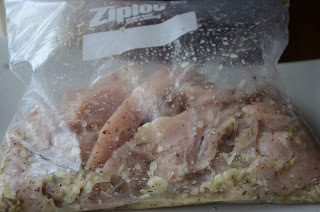 Put sliced chicken breasts inside the baggie, seal, and place in fridge allowing to marinate for about one hour. 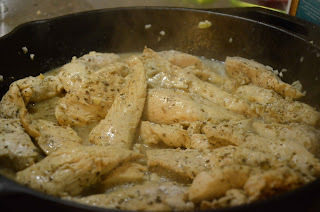 Preheat heavy frying pan to high, generously sprinkle salt and pepper over the chicken, and place chicken in single layer. 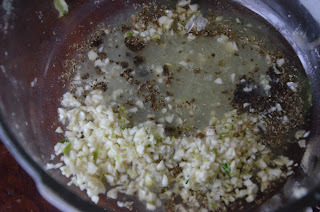 Cook on high for 1-2 minutes or until lightly browned on the one side. Flip and repeat on the other side. 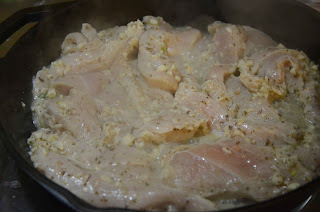 When both sides are browned (don't cook it all the way through yet), turn the heat down to LOW and cook for about 10 minutes or until chicken is tender and cooked through. 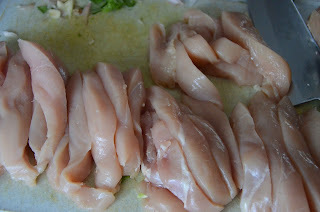 Remove from pan and allow to cool for about 10 minutes before slicing into smaller pieces. Heat the flatbread for about 30 seconds in the microwave or until soft and pliable. 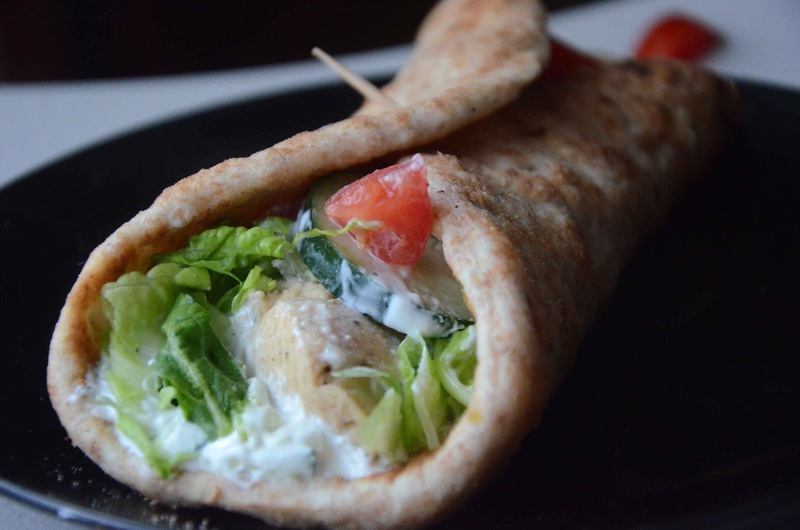 Layer tzatziki sauce, chicken , tomatoes, onions, cucumbers, and lettuce. Roll and enjoy! To get them to stay wrapped, use a toothpick or wrap it in foil. Recipe adapted from Tide and Thyme. Lara - That looks awesome! Exactly like what I'm craving at the moment. 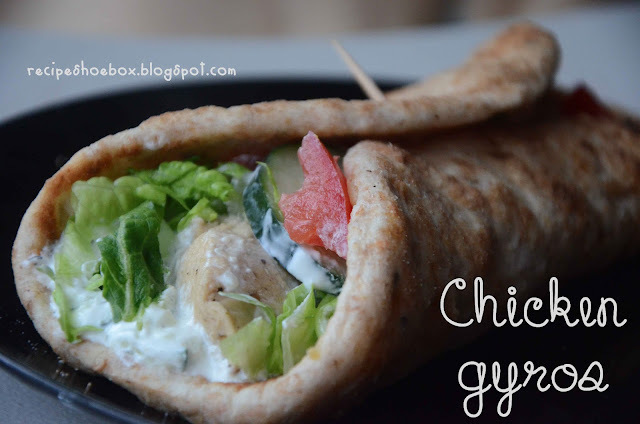 mmm, i haven't had a good gyro in a long time, these look so good!